Hey again, friends, ready for the last post! Here we go:). 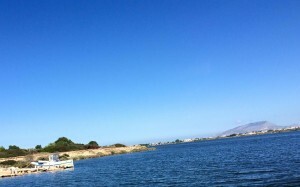 This blog post will be discussing the Syracusan fort aka Euryalus Castle, where my group and I did some ‘sploring last fall, if you’ll pardon the alliteration. 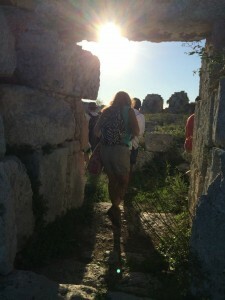 One of my friends exploring one of Euryalus Castle’s many doorways. The fortress is technically located in the town of Belvedere, but is really only a few miles away from Syracuse proper. It lies on the Epipoli ridge, and is composed of a series of walls, towers, and also underground tunnels, as well. It was built in the 400’s in the BC era by the Syracusans, specifically by Dionysius the Elder. He did so in order to renovate a part of the fortifications on the Epipoli that could withstand the attacks of the Carthaginians, which Syracuse and the surrounding area was facing at this point in time (Unesco 121). The entire structure is composed of white, porous stone and as a result stands out from the countryside. I would imagine it also would stand out at night under a full moon, although I have yet to see that. Although the structure wasn’t built in a day, it was built fairly quickly to ready the Syracusans for the Carthaginian onslaught, and required a fair bit of labor. To be specific, this structure required “60,000 troops and 6,000 pairs of oxen” to be “mobilized”. Quite a few laborers! Overall, it was a great structure to explore, although a word to the wise-if you like climbing on ancient things, make sure not to climb here. There are park ‘guards’, so to speak, and they’ll certainly come after you if they catch you climbing too high on the guard towers here (not that I would know). UNESCO Heritage. 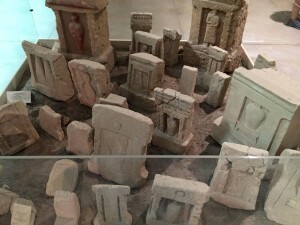 “Syracuse and the Rocky Necropolis of Pantalica: World Heritage Nomination.” Syracuse. Web. Tourism in Syracuse, Sicily – Euryalus Castle in Siracusa – Algilà Ortigia Charme Hotel.” Tourism in Syracuse, Sicily – Euryalus Castle in Siracusa – Algilà Ortigia Charme Hotel. Web. 29 Mar. 2016. Hey everyone! Ok, so for this next post, I really wanted to talk about Morgantina. I know y’all didn’t go there, but this archaeological site was so neat and filled with cool finds, plus there was a really friendly dog there. One of the coolest things about Morgantina was the fact that one of my professors, Professor Leigh Liebermann, had worked on the site, so how could we not like this place? One of the things that she pointed out to us herself were the mounds of votive offerings here (not pictured), which was a little overwhelming to think about from an archaeologist’s perspective (so much sorting to do!) but also still super interesting. 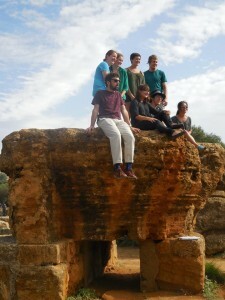 Liebermann, Leigh.”Morgantina Site.” Sicily Centro Trip. 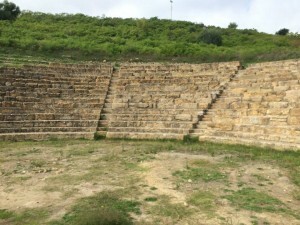 Morgantina, Piazza Armerina. Oct. 2016. Lecture. Lucore, Sandra K., and Monidka Trumper. 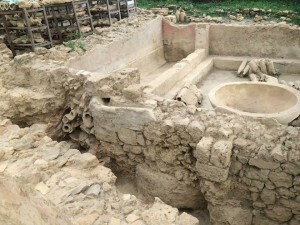 “American Excavations at Morgantina – South Baths Project 2013 Preliminary Report.” Morgantina. Web. <http://morgantina.org/>. Hey guys! I have to say, I’m getting to the last few posts about Sicily and I’m a tiny bit sad. At least we’ll be ending with some gems. This place surrounded by crystal-blue water is the beautiful island of Motya. Here, you’ll find some archaeological remains and a small museum including other parts of Carthaginian culture that have been preserved from the port of Lilybaeum, established in 397 BC (Holloway 155). Of course, not all the remains found fit with this lovely, picturesque atmosphere above. What were these rather un-picturesque remains? Tombstones, which many scholars believe belonged to children who were sacrificed on the island are featured in the Motya museum :(. Of course, since the Romans were the sworn enemies of the Carthaginians, there are some scholars that believe this was all Roman propaganda. However, the archaeologist Whitaker is thought to have found a Carthaginian altar, called a tophet, where some kind of human sacrifice took place on the island, with evidence that it continued into the second century. (Holloway 155). A much less depressing part of the museum is the Motyan Youth, put on proud display at the front of the small building. The statue itself was only recently discovered in ’79 and consequently, still has many scholars clamoring over it. The uniqueness of its stance and its almost seductive, yet strong and some might say masculine figure perplexes many. In addition, it is likely that it was sculpted in the fifth century BC, although there is contention among writers in this also. Scholars such as Bell agree that the youth is a charioteer, due to its dress. Whatever may be the case, it is beautifully positioned in the museum, and certainly helps visitors to take their minds off the tophet tombstones. Bell, Malcolm. “The Motya Charioteer and Pindar’s “Isthmian 2″”. Memoirs of the American Academy in Rome 40 (1995): 1–42. Web. Holloway, R. Ross. The Archaeology of Ancient Sicily. London: Routledge, 1991. Print. Salvete, amici. 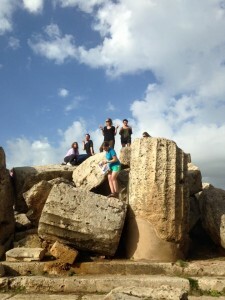 This, my friends, is the remains of Temple G at Selinunte, and yes, that is me from October of last fall, awkwardly looking where to step as my friend flashes peace signs in the background. 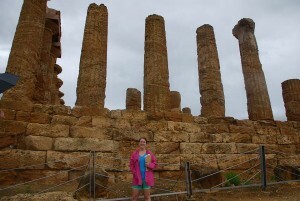 I may be biased, but this archaeological park is my hands-down most favorite place in Sicily. Hopefully, you guys really enjoyed it as well. Historically, Selinunte has some great stories and they’ve accomplished a lot. Not only were they the ones that moved around their riches to deceive the Greeks (see Thucydides), but they knew how to build their temples. Like, a ton of Doric temples. 8 temples are represented at this park, and although not pictured, many of them stand almost as they did two thousand years ago. Consequently, they rank as some of the best preserved temples in the world, along with the one present at Segesta and the ones in Agrigento (see next post). What’s amazing to me is that the majority of these temples were built in a span of 100 years, which suggests a sort of golden age before the Carthaginians wiped the floor with the poor Selinuntians in 409 BCE. But that, I suppose is another story. See you for the next post! Centro Program Selinunte Lecture, October 2016. Professor Matthew Panciera.